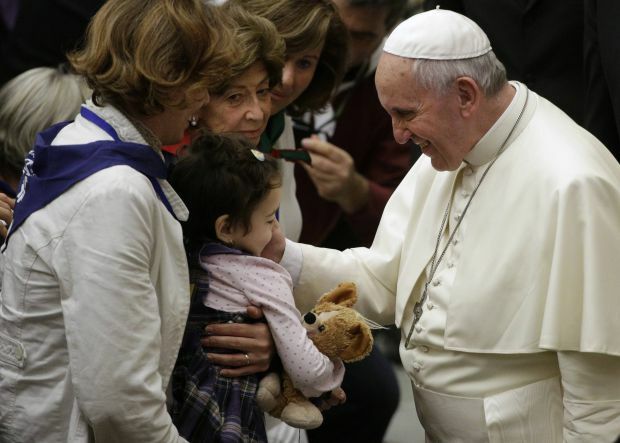 VATICAN CITY (CNS) — Becoming a mother or father is a gift from God, but women and men have a duty to embrace that gift and be astonished by its beauty, Pope Francis said. When people recognize that every child is unique and wanted by God, they will be “amazed by what a great miracle a child is,” he said Dec. 28, the feast of the Holy Family. While each family is “a cell” that together builds the body of society, large families are “a hope for society,” he said, they are “richer, more alive,” and governments should recognize the importance of “investing in” large families. He asked that Italy, with its low birthrate, pay greater attention to creating and carrying out policies that offer real support for families. Just a bit later in the day, the pope again highlighted the family, especially the role grandparents play, before praying the Angelus with visitors gathered in St. Peter’s Square. Close loving relationships between the younger and older generations are “crucial” for both society and the church, he said. The Holy Family is a simple but powerful model as it radiates “a light of mercy and salvation for the whole world, the light of truth for every human being, for the human family and for individual families,” he said. That light “encourages us to offer human warmth” to those families that, for whatever reason, are struggling with “a lack of peace, harmony and forgiveness,” he said. When parents and children live out their faith together, “they possess an energy that allows them to face even difficult trials, as the Holy Family’s experience demonstrates,” for example, in their flight to Egypt, he said. People should be reaching out with concrete support to families, “who are living through more difficult situations because of illness, lack of work, discrimination, the need to emigrate,” the pope said. He then led those gathered in the square for a moment of silence and prayer for all families who are facing hardship.